The master bedroom has a king size bed, brand new Sealy pillow top mattress, two dressers, TV, and ample closet space. The ensuite bathroom features a walk in shower. The guest bedroom features a queen size bed, TV ;closet and a dresser.The main Bathroom has a tub /shower set up. underground parking spot is included. It is a short walk to restaurants, shops, pubs, casino and downtown Kelowna. There is a beautiful water front walkway where you can enjoy a morning run or an evening stroll. Ohana Resorts has built a reputation on honesty ,integrity and resorts that offer the finest amenities in Hawaii,Mexico California ;and now the newest listing in Kelowna ,British Columbia.All units are furnished to the highest standards and professionally maintained.for references check listing number 628881,one of the units on Maui to see our reviews. Being right on the beach and Centrally located in the heart of the action this 14th floor lakefront view property is for the diserning renter. Once you have rented and become part of our Ohana (family) You will be eligible for a 5% discount other resort properties on the beautiful island of Maui or Los Cabo’s Mexico. Beautiful condo with a beautiful view of the lake! We stayed at this condo in February. The condo itself is beautifully furnished and well-equipped. The beds were very comfortable, good quality towels and there were even lovely terry robes in the closet. But it is the views that are breathtaking - from the living room and both bedrooms. There is an indoor pool, hot tub and steam room downstairs in the building that we used almost every day - very nice facility. We also used the fireplace in the condo. At a warmer time of year - the deck would have been the place to be. The owner was lovely and very responsive to any questions we had before and during our stay. Easy check in. Clean. Good location. Clean. Spacious. Well kept and quiet. We would definitely use this property again. My girlfriend and I stayed at this property during a week of radiation treatment. It was absolutely the best. It was so comfortable and we needed for nothing as far as dishes, toiletries, etc. The towels were plush, bedding and beds were great. Appliances were awesome. It was so nice to have so much of the necessity items such as salt, sugar, margarine, jam, at our disposal. Fireplace was extremely comforting on the chilly nights and mornings. I would gladly recommend this property and hope to return under vacation circumstances next time!! Thank you so much for the great review Barb! You are welcome back anytime! 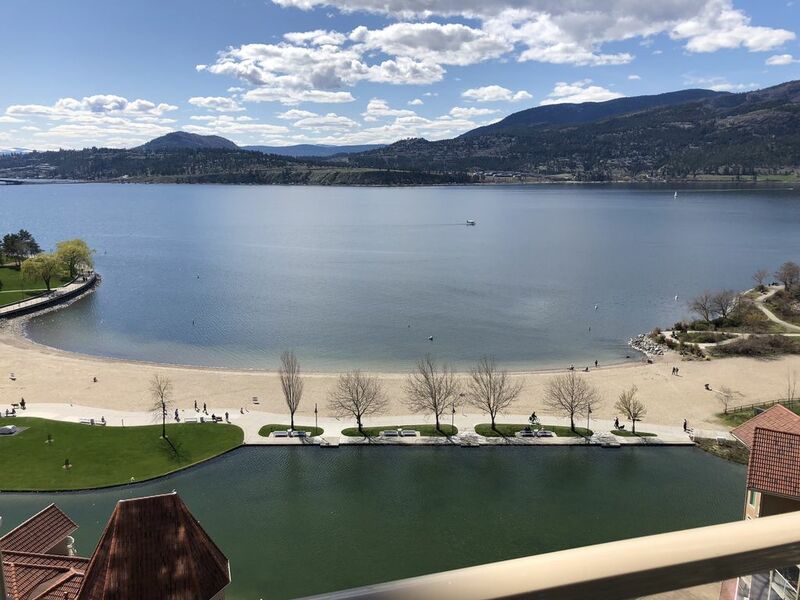 We enjoyed our stay and the condo is in an excellent location and has a wonderful view of Okanagan Lake. It is nicely decorated and well appointed. Lucy was great to deal with. Thank you! Thank you Kathryn 🤗 I would love to have you back! This condo is beautifully decorated and is in a wonderful location. It has a wonderful view of Okanagan Lake. The condo is well stocked and very clean. Lucy, thanks for sharing your condo with us.